Each week I welcome a guest author to share a first meeting excerpt. 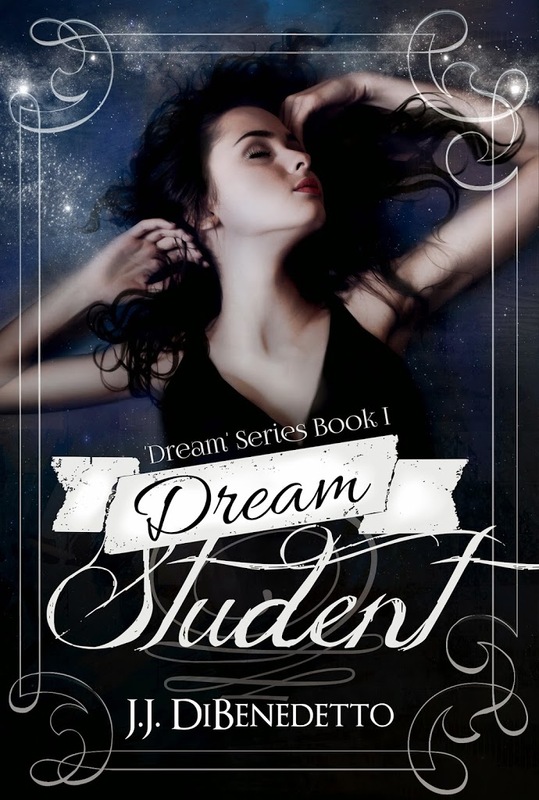 Today on First Sight Saturday, I’m joined by J.J. DiBenedetto with a New Adult Paranormal Romantic Suspense call Dream Student (Dream Series, Book1). And isn’t this a beautiful cover? A fun fact about J.J.: I was married at Graceland — in the private chapel on the Elvis Presley estate. So, on to the first meeting! It’s him. The guy at the table under the fighter plane is the guy on the court. The one from the dream. It’s definitely, absolutely, bet-my-life-on-it him. That’s impossible, isn’t it? It wasn’t real, he wasn’t real. It was just a stupid, weird dream. But he’s sitting right over there! And so what? I’m in uncharted territory here, but I know it has to mean something. I didn’t just dream about him. I was inside his head, or he was inside mine. Whichever. There was him, and then there were the nightmares. At least the dream with him, as weird as it felt, wasn’t all creepy and horrible. Actually, if you take away the weird, it didn’t feel bad at all. So if the nightmares are making me crazy, maybe this guy will–what? Make the nightmares stop? Make me sane again? I don’t know, but I have to find out. I don’t wait for an answer. I head straight for my mystery man. I’ve seen love at first sight happen. When I say that, I mean two people seeing each other for the first time and the moment their eyes meet there’s an instant connection. It’s almost like electricity, everybody in the room can feel it. I’ve been there when it happened, and there’s no doubt at all that’s what it was. Say what you want about it being silly or sappy or just plain BS, I don’t care. I know it’s real. That’s what it feels like when I’m halfway over to him, and he turns his head, sees me, and we make eye contact. Everything else disappears. There’s me and him and nothing else in the world. We’re connected. I don’t know why, I don’t know how, but that doesn’t change the fact that it’s happening. And now I’m there and he’s staring at me like he can’t believe I’m real. It’s OK, I feel the same way. I reach out, put my hand on his arm and I really expect to feel sparks or something, but I don’t. It’s just him, just the fabric of his shirt. I slide my hand down his arm and I can feel the goosebumps as I go. I’ve got them too. I take his hand, and now I’m pulling him away from the table and everything else is starting to come back. It’s louder than it seemed a few minutes ago, and it feels much too crowded all of a sudden, and what I need right this second is quiet and just him. “We have to talk,” I whisper in his ear, and he doesn’t say anything but he does follow me. There’s a back door, it looks like there’s a patio for when the weather’s nice. I head for it, and I need it to be open and it is and out we go. I don’t feel the cold at all. It’s perfect, just the two of us, and with the door closed the noise from the club is all drowned out. He can feel it, too. He knows we’re connected; he knows this is exactly where we’re supposed to be the same way I do. Neither of us says anything at first. We’re just looking at each other, trying to think of the appropriate words. The silence goes on for probably only a few seconds, but it feels like minutes or even hours. Now I think about it, I have seen him before–outside the dream, I mean. I’ve seen him on campus. He’s–I think he lives over in Allen House, the dorm right next to mine. Which means he lives probably two or three hundred feet away from me. I never really gave him any special notice before, but now that he’s right in front of me, he actually is kind of handsome. He’s on the tall side and pretty slim and he’s got short, dark hair and the brownest brown eyes I think I’ve ever seen. Angry? Not at all. Freaked out? Yes, very much. But not angry. “No. Why should I be? I’m–I’m flattered, I guess. I didn’t think anyone dreamed about me like that.” If I hadn’t seen it, I never would have believed I was a part of anybody’s romantic fantasies. Interesting premise, to know there is going to be a connection before you actually meet. Love before first sight! Links to purchase Dream Student and to find J.J.
J.J. and I both welcome questions and comments. Come back next week for a first meeting excerpt on First Sight Saturday. And in case you’re wondering why I have a New Adult author visiting…hmmm…could this be a hint of things to come? Thanks for visiting today, J.J! Wonderful cover… so pretty and I loved the excerpt! Shared! Enjoyed reading the excerpt. Great cover!